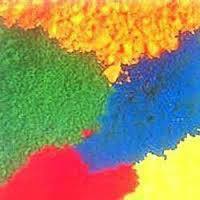 Leading Manufacturer of printing hot dyes from Ahmedabad. These are monochlorotriazine reactive dyes having a low reactivity and low substantive. Since these dyes have low reactivity, they require more severe conditions for fixation with cellulosic materials. They are readily soluble by pouring water of 80-85ÂºC on powder & stirring well. They are applicable on cellulosic materials by both dyeing as well as printing methods. Looking for Printing Hot Dyes ?